It’s been just over a month since Cat Club launched our online competition for cat lovers who feel they own the cutest kitty cat or the top tom cat! 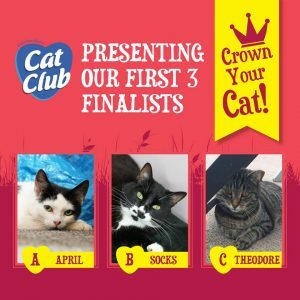 and we are delighted to announce the first 3 finalists from the first stage of our ‘Crown Your Cat’ competition! Don’t they look purrfect?! Over the next week we will be publishing the inside scoop on all of our finalists, so be sure to check back in with us throughout the week to read about everything from coming home stories to adorable antics and of course Cat Club! Or to keep up to date with all the latest competition news, info and lets face it – most importantly, adorable photos! Why not check out our Cat Club Facebook and Twitter pages where you’ll be able to read our interviews as soon as we post them. If you weren’t shortlisted this time, don’t worry, the entry process is now OPEN again for the second period and we’ll be selecting another lot of finalists later this month! Haven’t heard about our competition? Read below for your chance to help us find the King or Queen of our Cat Club! Entrants can upload a photo of their favourite furry friend, who could become the first ever ‘real’ face of Cat Club in Ireland. The winner will have their photo emblazoned on thousands of the popular brand packs and cans, which will be sold in Ireland in 2019. To enter, Cat Owners simply need to complete a short online entry form and upload a photo of their cat. The competition will be open for entries from July until the end of October 2018. A panel of judges will choose the winning cat in November. As well as a bevy of prizes for the cutie cat including a professional photo shoot, a supply of cat food and cat goodies, the winning cat will be featured on Cat Club Packs from January 2019.